Instead of fretting when her beautiful hair started to fall out in her 30s, Xiang Renxian decided to transform it into a lasting gift- a hat and coat for her husband. The former schoolteacher in Chongqing, China began collecting her shiny black strands as it fell out over the years. In 2003 she came up with the idea to preserve her hair, by weaving all 116,058 strands of hair into keepsake clothes for her husband. Not many men can say their wives have made them such a personal gift. Xiang started on her human hair coat and hat in 2003, and worked steadily on it for eleven years to complete the hairy gift. Developing her own knitting technique, she collected her long silky black locks in singular strands from her hairbrush and around the house. Measuring around 27 inches, the strands were bound together to make a stronger thread. Keeping count of 116,058 strands of hair is no easy task. 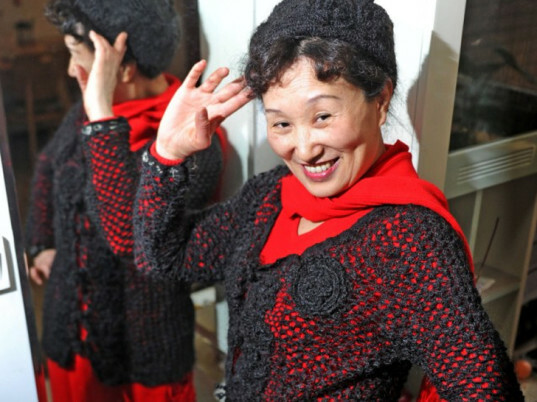 Xiang began by combining 15 pieces of hair to use as a singles strand to make her husbands coat. Over the course of five years, she saved and knitted enough hair to make the main body of the coat. For the hair-hat, she used 20 strands of hair as one, carefully weaving them together as one strand to make a more rigid surface than the coat. The coat was finally finished last year, after Xiang decided to add her signature on the back. It took quite a bit longer for the 60 year old to collect enough grey hairs to complete her name on the back. and notice she's wearing it not him! Haha he couldn't look less interested in the shot they chose. Also it looks more like a sweater than a coat... Either way, that's some determination right there. Kudos to her for finishing it finally! Instead of fretting when her beautiful hair started to fall out in her 30s, Xiang Renxian decided to transform it into a lasting gift- a hat and coat for her husband. The former schoolteacher in Chongqing, China began collecting her shiny black strands as it fell out over the years. �In 2003 she came up with the idea to preserve her hair, by weaving all 116,058 strands of hair into keepsake clothes for her husband.